PULLMAN, Wash. – Chemical engineering PhD student Kevin Gray is headed to Japan in November to do a fellowship at a prestigious international school. Gray will work under Dr. Fadel Samatey, a collaborator with Gray’s advisor Dr. Alla Kostyukova, at The Okinawa Institute of Science and Technology Graduate University for four months. Samatey will give him training in protein crystallography and X-ray Diffraction. “I am extremely fortunate to be working with Professor Kostyukova. She has a wide breadth of research techniques, and it is because of her connections that I even applied for this fellowship,” he said. Currently he is preparing the Tropomodulin-2 (Tmod2) protein samples that are part of his graduate research to take with him to Japan. Tmod2 is a protein expressed in brain tissue. Altered amounts of the protein appear after strokes, after methamphetamine exposure and in Down’s Syndrome. 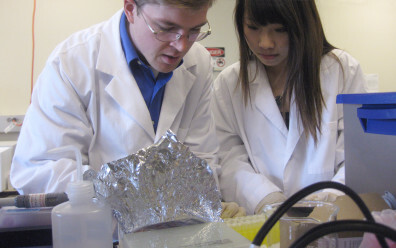 In addition to learning the crystallization process, he hopes to crystallize his protein samples and then gather structural data using X-ray Diffraction. “We are currently doing fundamental science to better understand the protein,” he said. “Once we better understand it, that information may be used later down the road to suggest targeting Tmod2 regulation which could alleviate symptoms in conditions such as Down’s Syndrome,” he said. Originally from North Carolina, Gray grew up in Redmond, Wash. He earned his undergraduate degree at The Georgia Institute of Technology. “While I am excited to continue my research and learn new techniques, I’m also looking forward to being somewhere new and meeting new people,” he said. PULLMAN, Wash. – A WSU-Tri-Cities chemical engineering PhD student won third place in a student poster competition at Pacific Northwest National Laboratory. Xiaohui Ju’s research is related to biofuels. She and her advisor, Xiao Zhang, are working to understand the deconstruction of cellulose in biofuels in hopes that their findings will lead to more efficient methods of biofuel production. Ju presented her poster, Mechanism of Nanocrystalline Cellulose Decrystallization during Enzymatic Hydrolis, at PNNL’s Environmental Molecular Sciences Laboratory (EMSL) annual user meeting. Her research is supported by a National Science Foundation award. “It is a very good opportunity for a brand new student to get to work with professional scientists, and getting recognized for my work makes me feel I’m doing something important for renewable energy,” Ju said. Opportunities such as developing and presenting that research are part of what brought Ju to WSU. 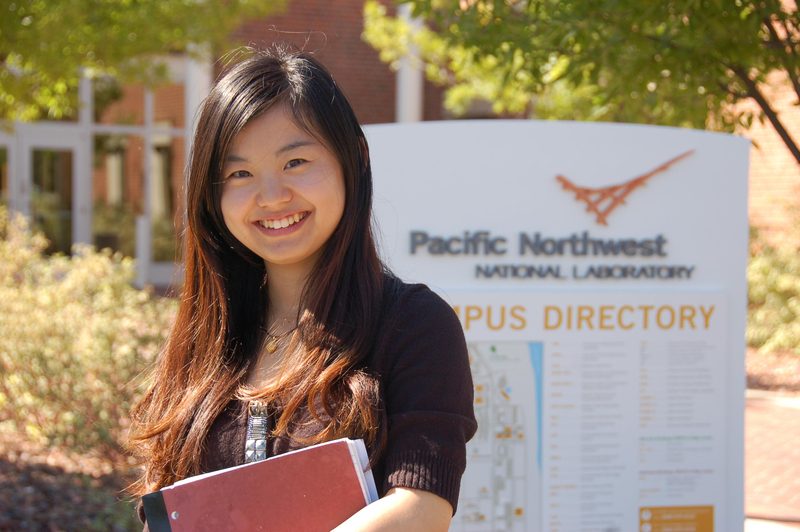 Originally from China, she earned her bachelor’s there, and then came to WSU because of its prestigious chemical engineering program and involvement in biofuels. “My advisor is very helpful in giving me instruction, and I appreciate the chance to come here where there are many opportunities for career development,” she said. Ju hopes to finish her doctoral degree within the next couple of years, and then plans to stay in the area and continue to work in the development of biofuels. Ju sees it as a promising industry, and would like to help make it commercially viable. Zhang is confident in her ability to pursue her goals. “She is a very intelligent and hardworking woman,” he said.